Must have player features in a limited edition classicvintage package! 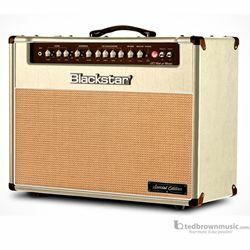 Created by and for AIMM retailers, this amp features 40 Watts of British tube power with a 12" Celestion speaker and includes the latest features and benefits of the new Blackstar HT Venue MKII Series. This amplifier was designed by and for AIMM retailers in conjunction with Blackstar product specialists. A special thank you to Mark (Ted Brown Music), Phil (Alto Music), and Chris (Skip's Music) for their work on this exciting new AIMM exclusive!